Team Byrdie definitely operates by an M.O. of polished simplicity year-round, but that certainly rings true during the warmest months of the year: When we'd much rather spend these precious hours catching rays outside than hunched over our vanities, finding an arsenal of easy, reliable products is key. And most importantly, they better hold up on the steamiest of summer days. These are the exact parameters we considered while putting together The Byrdie Bag—an expertly curated collection of our absolute favorite summer hair and makeup products, all housed in an adorable, limited-edition leather Pop & Suki case. 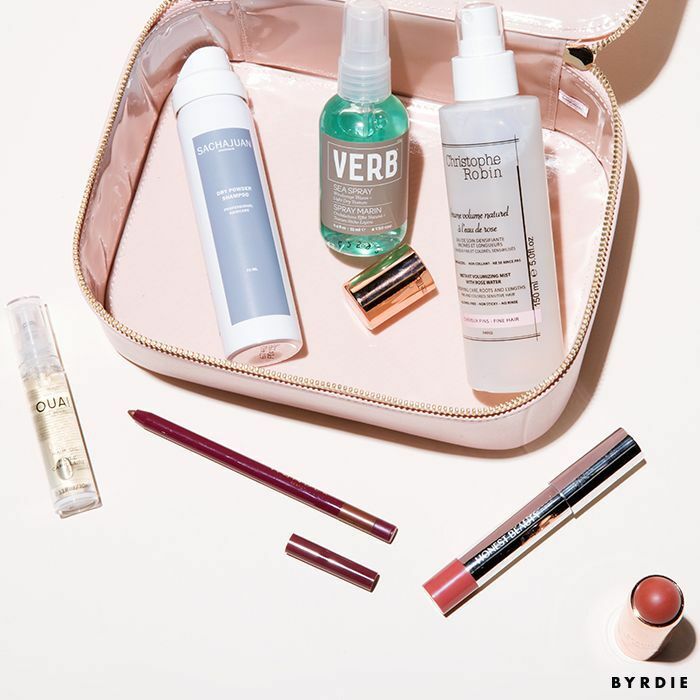 From sea salt spray to a must-have lip tint, every item was handpicked by a Byrdie editor—so you can rest assured that even though we field hundreds of products on a regular basis, these are among the very best. The Byrdie Bag ($115) is valued at $279, making it the summer's ultimate beauty steal. Just keep in mind that we only made a limited number of them, so you'll want to scoop one up sooner rather than later. And anyway, summer starts tomorrow—what are you waiting for? Get a closer look at all the products inside the bag here.